With established companies like Spyderco and Kershaw embedded in the market for decades, it’s hard to break into the knife industry. Sure, companies like Steel Will Knives and Kizer have made names for themselves in the crowded knife market over the past few years, but I imagine many other small companies have failed over that time. That’s why I was intrigued when David McHan of American Buffalo Knife & Tool reached out to me about reviewing one of their knives. I had never heard about the brand before, but I took a look at the fairly robust catalog and was interested in seeing the quality of these knives. So I chose one of their models and David sent me the one I requested — along with a few others — to take a look at. As I typically do with reviews of products from less established brands, I’ll give you a brief background. American Buffalo Knife and Tool, also known by the more accessible initialism ABKT, is a gun care and cutlery company located in Sweetwater, Tennessee. 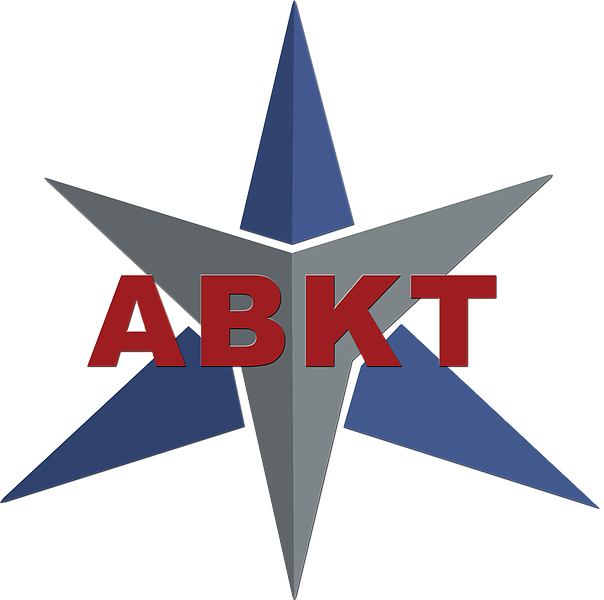 ABKT designs, makes, and distributes all types of cutlery and gun care products, which are made in China and imported to the United States. Here’s where things get a bit confusing. Under the American Buffalo Knife & Tool umbrella are five different sub-brands or categories. One is ABKT Gun Care so we’ll skip that one since it doesn’t pertain to knives. 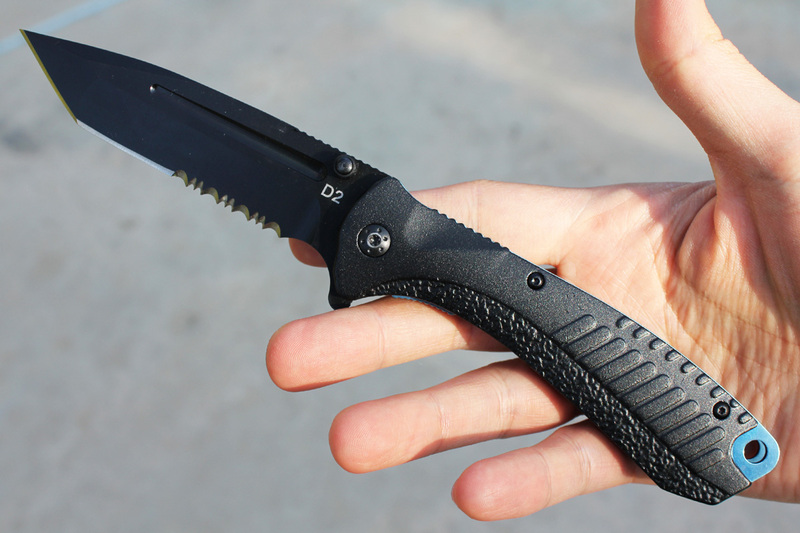 ABKT Knives – This is an assortment of cheaper knives made for hunting and everyday carry. There are flippers with a tactical look along with some fixed blades. ABKT Elite – This is their higher end assortment of knives. I believe all of them are made with D2 steel and use higher-grade materials. 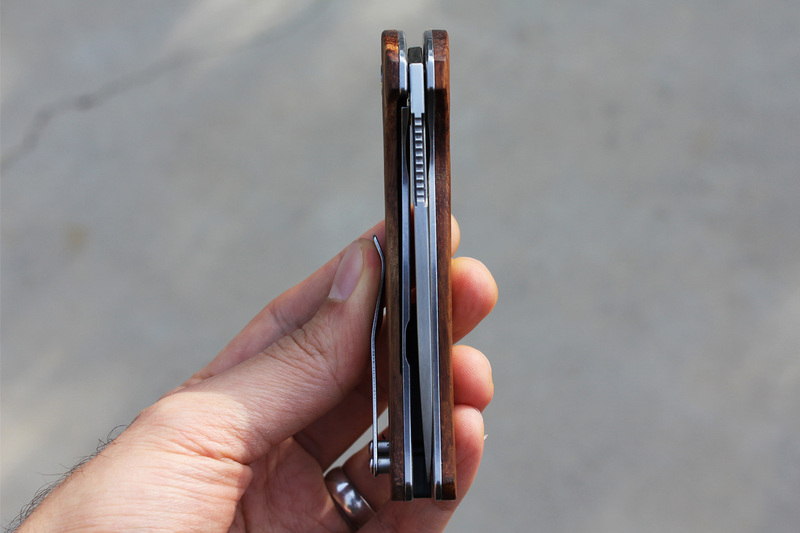 Aside from the fixed blades, they are all flippers that use a ball-bearing opening mechanism. Roper – These are more traditional knives, with designs that mimic those made by Case. You’ll see trappers, peanuts, and stockmans. 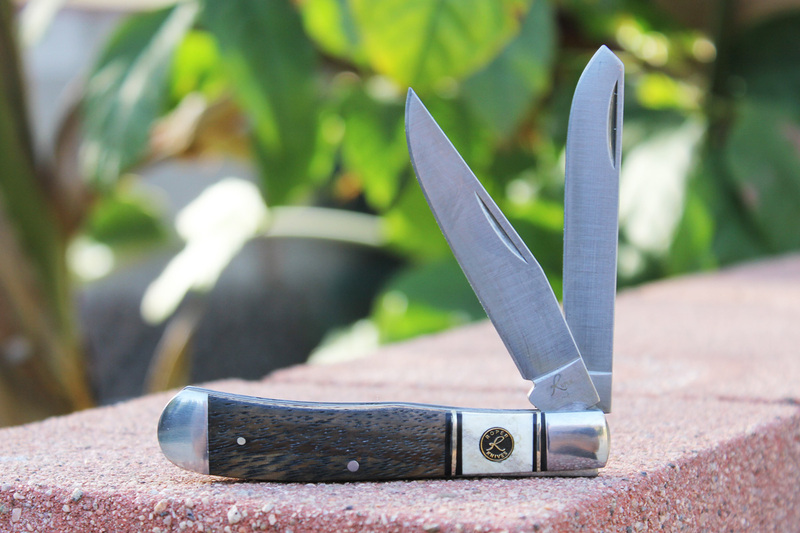 Cattleman Cutlery – This line is targeted toward working farmers or cowboys and feels like it could be lumped with the Roper brand. There are some of the same traditional patterns along with two models that look like Spyderco designs (or the SOGzilla Spyderco-like design). With that out of the way, let’s get to the knives. 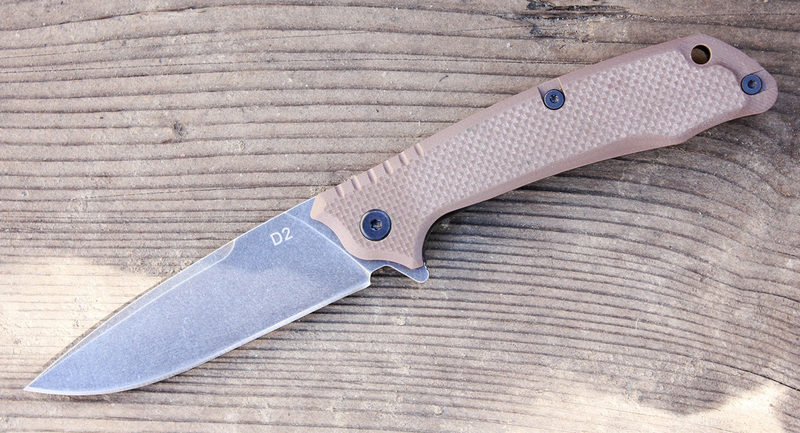 I opted to review the Desert Scavenger because it seems most in line with what I would carry. The product descriptions on the website and catalog are a little incomplete, so here are my measurements. Out of the box, the knife was the size I expected. It has a 3.5-inch drop point blade and a 4.5-inch handle — making for an overall length of 8 inches when open. The blade is said to be D2 tool steel with a stonewashed finish and I have no reason to believe otherwise. The first time I opened the blade via the flipper tab, it was smooth as butter. That’s likely thanks to the ball-bearing mechanism ABKT touts. We’ll talk more about that later. 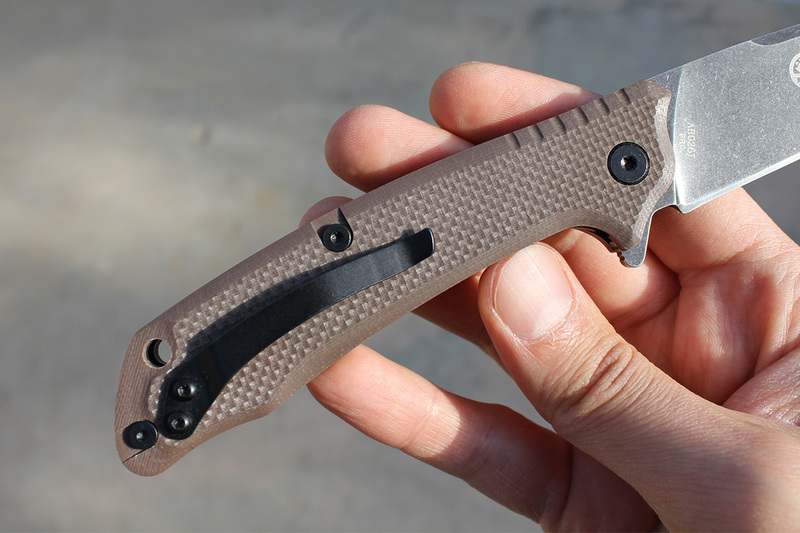 The model I received is called the Desert Scavenger because it has brown G-10 handle scales. 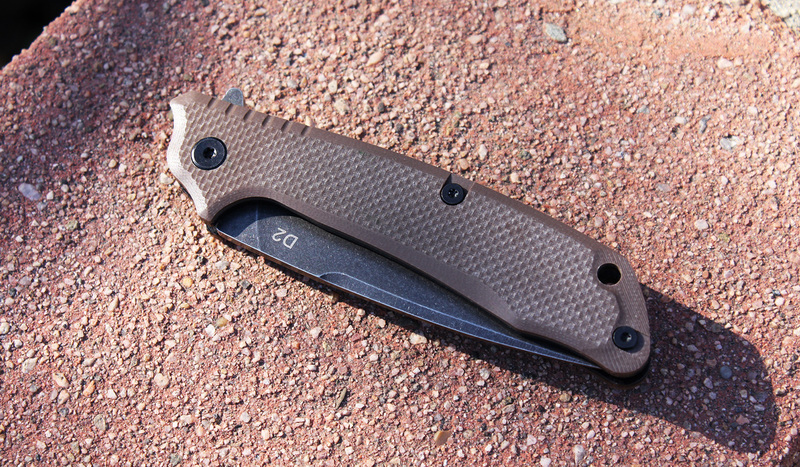 There is also a Shadow Scavenger with black G-10 handle scales. The lightly textured scales are affixed to black titanium coated liners. 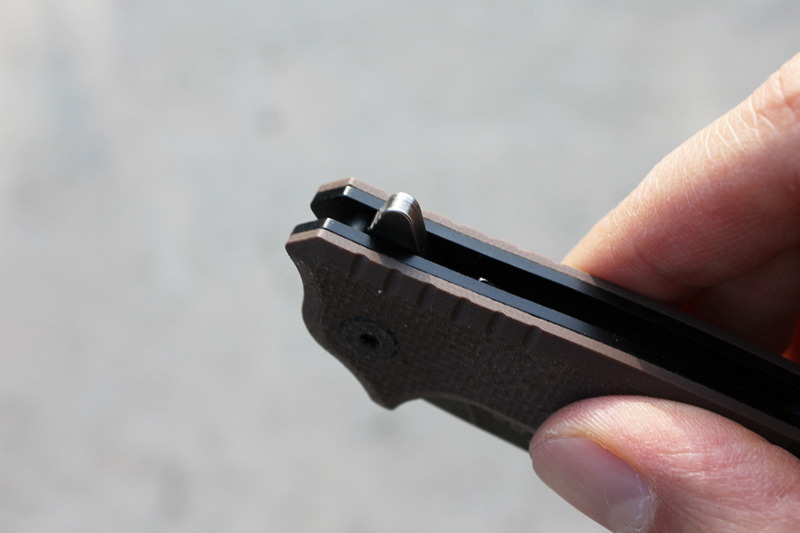 There is a one-position (tip-up, right-hand carry) pocket clip. My initial impressions of the Scavenger were very positive. When I first got it, there was absolutely no blade play and the centering was perfect. There were also no blemishes that caught my eye so I was keen on carrying it around. One underrated aspect of this knife is the overall lack of branding. You’ll often see logos and branding on the clip, the blade, and wherever else they can squeeze it. The only stuff on this knife is “D2” in white letters on the blade, the model number and “PRC” (likely for People’s Republic of China), and the ball-bearing opening symbol. Other than that it is clean and sleek. The knife was well oiled and sharp right out of the box. I’ll break things down further between blade and handle in the next sections. ABKT has pretty radical blade designs in some of its other ABKT Elite offerings. 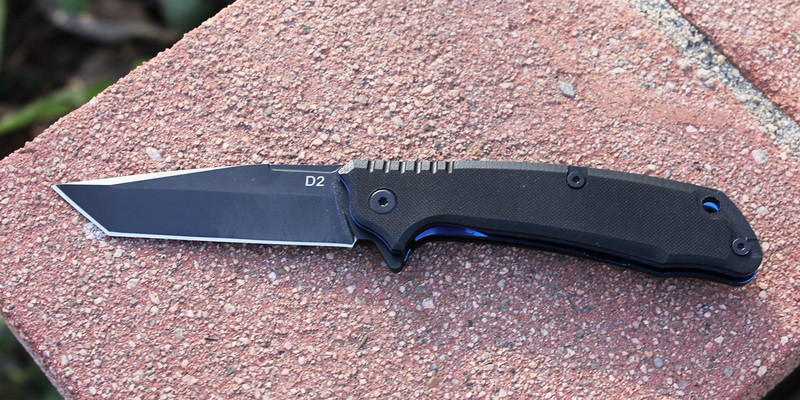 For example, the massive Blue Tracer has a modified tanto blade with a fuller and a partially serrated edge. I’m not a huge fan of tanto blades, which is why the Scavenger jumped out to me. It has a pretty standard drop point blade design that’s 3.5 inches. The blade is a bit longer than I prefer on my EDC knives (my ideal is around the 3-inch range), but the shape is simple and functional. The blade also has a swedge — that section of the spine from the tip to about 3/4 up the blade that gives the appearance of a second edge. Although these unsharpened swedges are said to be mostly cosmetic, they can help improve thrust cuts because they make the tip thinner. 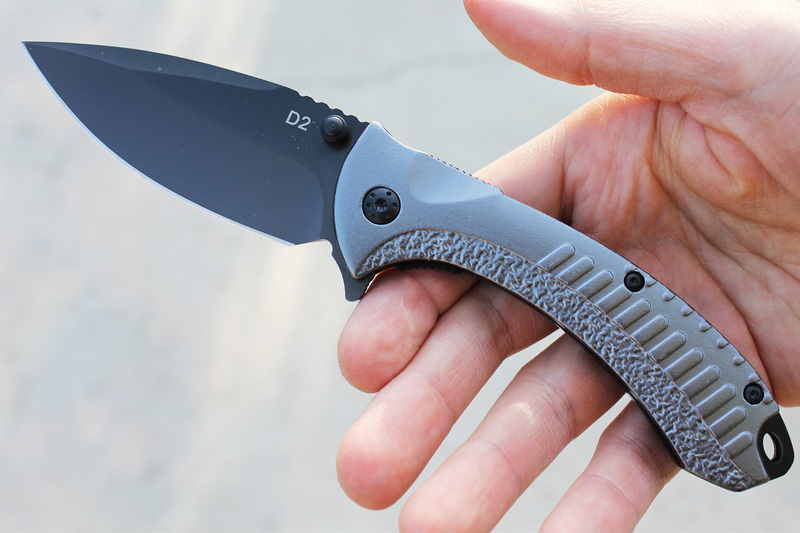 Now onto the big deal here: the D2 steel. It would be easy to guess that a relatively inexpensive knife from China would have basic 8Cr13MoV steel, which can actually be good for most people. 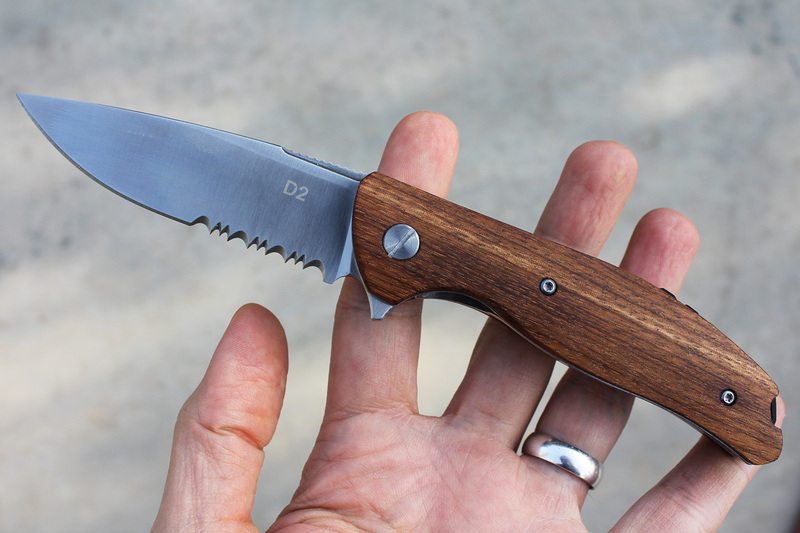 But this knife is said to have D2 steel, a steel that’s considered to be a step up and something many consider to be high end. D2 steel is a tool steel that’s sometimes called semi-stainless because it doesn’t meet the chromium threshold to be classified as stainless. 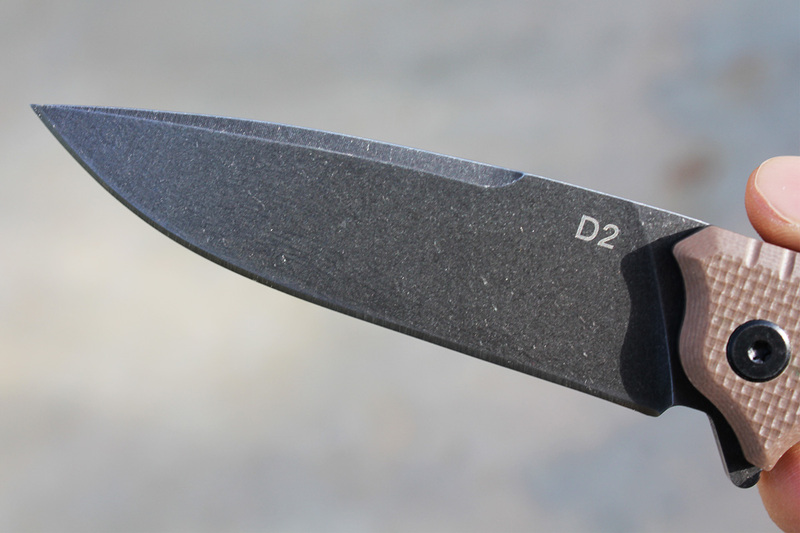 That means D2 is not great at corrosion resistance (though the stonewash finish on this knife may help), but it does hold an edge well. The other tradeoff is that it’s tougher to sharpen. Still, D2 is a great steel. The ABKT site sells the Scavenger for $49.99, which is a great deal for the steel. I’ll go into in the comparisons section. I’ll also talk more about how it performs later. As I said, the knife opens via a flipper tab. Because this is primarily a flipper, there are no thumb studs or visible stop pins on the blade. I like that rather than having phantom thumb studs like ABKT has on a few of its other models, like the Blue Protector. It also uses a ball-bearing technology that I’m not sure is proprietary. Either way, it is smooth and reliable. Seriously, I’ve opened this knife hundreds of times and I’ve never had a false opening, not once. I was curious just what kind of ball-bearing technology it uses, so I opened up the Grey Protector they sent me as well. 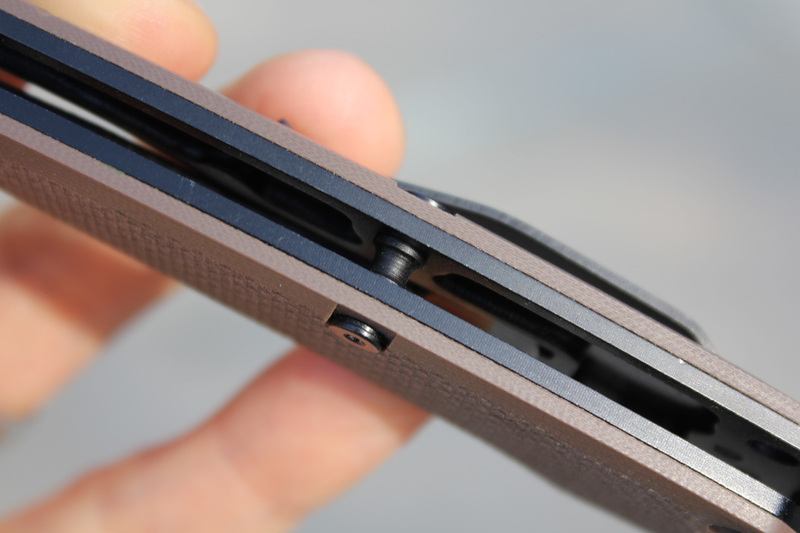 Fortunately, the knife is built with standard torx screws, making disassembly and reassembly a breeze. It uses caged ball bearings so they don’t get everywhere like IKBS. I need to brush up on how there can be so many types of bearings that look and function the same, but this appears to work like Kershaw’s KVT. It uses 10 caged ball bearings for its smooth opening. This also means it will need care and maintenance, but assembly/disassembly is easy so it shouldn’t be an issue. The blade locks up with a liner lock. It has a lockup of about 50 percent, which means the lock stops at about halfway. People debate over the percentages and desire an “earlier” lockup since the percentage will go up as the knife gets older and more used. At about halfway, the lockup on this knife is fine though. In one of the only other reviews for an ABKT knife I saw on YouTube, the user of a different model — the Phantom Spector — had the knife nearly fail since the liner protrudes too much and has aggressive jimping (he was also holding it with his left hand). I didn’t experience anything like that in this model, though some of the other ABKT Elite Knives have that feature so beware. The handle to me is unspectacular — but sometimes that’s all you need. The G-10 handle scales provide a fair amount of grip and the ergonomics are adequate. After use, I never noticed any hot spots or discomfort. It also works quite well in more than one grip position. 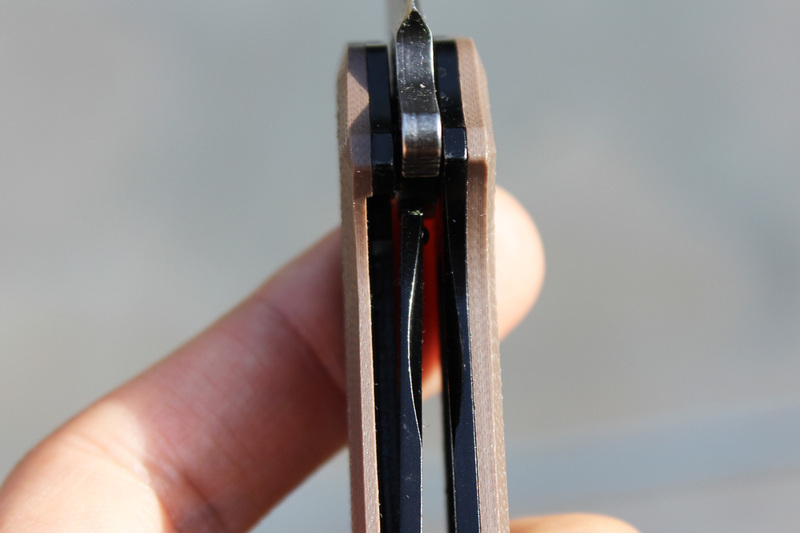 As previously stated, the clip can only be in one position. I think this is fine because it’s in the tip-up position, which is essential on a flipper knife. This does mean lefties will have to deal with it or get a different knife. All you tip-down carriers are out of luck too. One thing I like is that the liners are skeletonized. Not only do I think this won’t affect the overall performance and durability of the knife but it also cuts down on the weight. I tried to take a picture inside the scales, but it might be hard to see. Some of the other ABKT models, like the nearly identical Blue Impact (except with a tanto blade) have blue anodized liners, which I find a bit too gaudy. I’ve carried this knife on and off for a few months. It’s definitely bigger than I typically carry as an EDC (I find the Benchmade Mini Grip to be a perfect size), but it has performed admirably. The opening is always smooth and reliable, the blade shape is versatile, and the knife is well-constructed. For everyday tasks, it was great. I didn’t do any insane testing or torture tests, but I decided to do 100 short cuts to cardboard to see whether the steel would hold up. I did the paper test after every 25 cuts, and it still sliced through paper without much problem after 100. I have little doubt it is D2 steel. As I said earlier, the MSRP of the Scavenger is $49.99. These knives are not yet available anywhere else as far as I can tell, so there’s no street pricing I can see. Still, the price tag is not bad for a solid ball-bearing flipper with D2 steel. 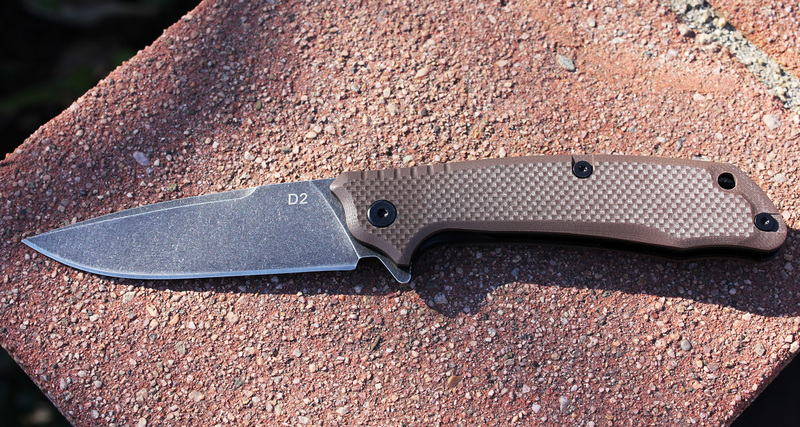 There are a fair amount of D2 knives out there, but the price is often a bit high. 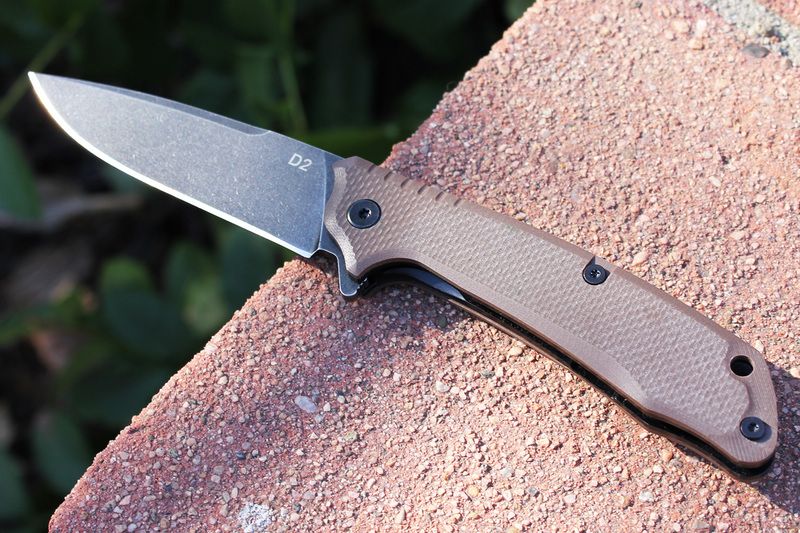 The Steel Will Gekko is a gorgeous knife with a D2 blade but the pricing is a steep $203.99 (though it has Micarta scales and is made in Italy). 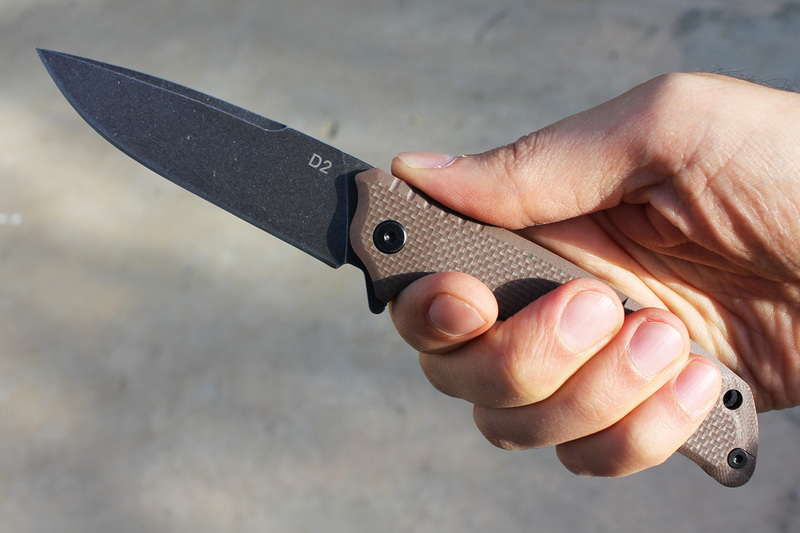 I argue the direct competitors are the D2 offerings from Ontario Knife Company. 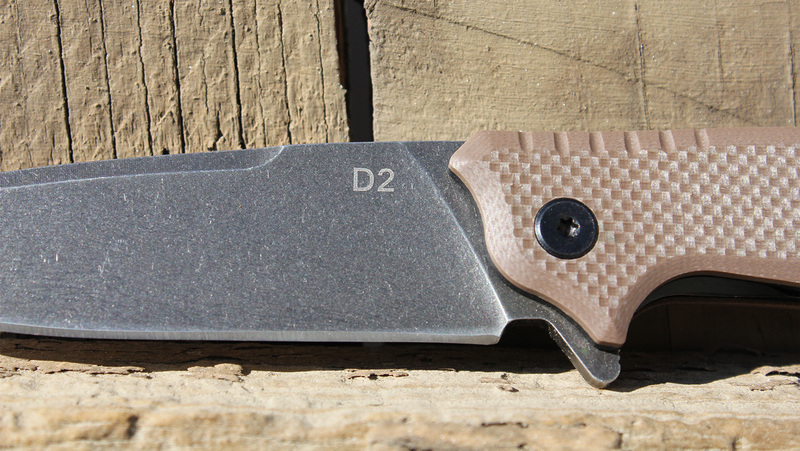 The Ontario RAT Model 1 is available in D2. You can find it for as low as $40, but there’s also the special edition with carbon fiber handles and D2 steel for about $58. There’s also the robust Ontario Carter Prime with a 3.37-inch blade and titanium handles for almost $100. The ESEE Zancudo in D2 is around the Scavenger price range as well but smaller. 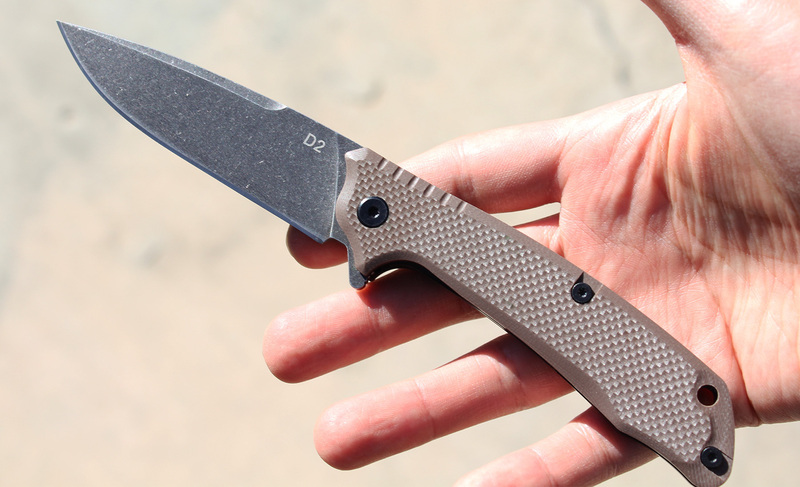 The Ontario Dozier Arrow and Boker Plus Caracal are also around the same blade size with D2 steel — but both are more expensive. Along with the Scavenger, David at ABKT sent me five other knives. He sent me the Blue Impact, Grey Protector, Blue Tracer, Laredo Trapper, and Roper Outlaw. The reason I chose the Scavenger to review is because none of the other knives really stood out to me. I probably won’t review these in depth but I wanted to touch on them because they do have some impact on my final thoughts about the Scavenger. This one is nearly identical to the Scavenger but with blue liners, black scales, and a tanto blade with jimping on the spine. The action is just as good. Interestingly, despite the scales being nearly the same, the texture of the G-10 is finer. I don’t know whether this is just because they’re different models or because of material inconsistencies. The blade is also 3.5 inches and has a swedge but is a little more rounded. The handle ergonomics are a bit wonky. The aluminum scales are too curved to hold comfortably for a long period of time. Also, although the action is generally smooth, I absolutely hate the jimping where the flipper tab is. As Nick Shabazz once said, I want a smooth landing for the flipper. I don’t want my finger to grate against jimping or unnaturally stop. This knife is massive. It has a 4-inch blade and an overall length of 9 inches when opened. Perhaps due to the length of the jimping behind the flipper tab, the action isn’t as smooth. The handle ergonomics are a bit more comfortable than the Grey Protector. It is also a heavy 6.1 ounces. This is a handsome knife. Again, it’s a bit big with a blade of more than 3 inches but still manageable at 3.5 ounces. I like the stainless steel bolsters and the stag and wood handles (though I did have to pop the emblem back into the handle because it was sticking out). It opens and closes without any problems. I can see this being a solid gift for an old timer. Despite being thick, I really love the zebra wood handle scales on this knife. The one I got was way better looking than the image on the website. There was a huge problem though. The blade centering was way off. I was able to fix it with a little work but coming from the factory that way is a bit alarming. Otherwise, the lockup was good and early and the opening action was smooth. I really like the ABKT Scavenger. It is a well-built knife with smooth action, great steel, and a simple but effective design — all for about $50. There are no notable flaws in the knife that I found… but this comes with a caveat. Of five other knife models they sent me, at least three had some fit and finish issues, which is why my endorsement of the knife is tepid. Had I only handled this knife, I would whole heartedly endorse it. However, there is a possibility you could get one that comes from the factory with some defects or an off-centered blade. Still, if you want to try a new brand with good materials at a relatively affordable price, I recommend checking out the ABKT Scavenger. This is a workhorse of a knife that uses good steel and has a straightforward design.